Detective Eve Dallas and her partner, Peabody, are following up on a senseless crime-an elderly grocery owner killed by three stoned punks for nothing more than kicks and snacks. This is Peabody’s first case as primary detective-good thing she learned from the master. 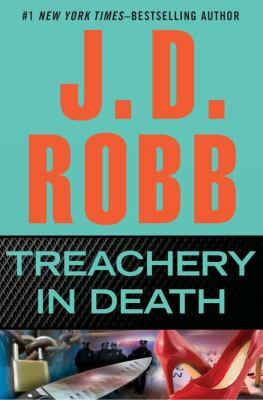 I’ve already talked about Treachery in Death a couple of times on the blog because I absolutely love this series. I think it is pretty incredible that the series has over 30 books and just keeps getting better. I have read every book published so far and have yet not to enjoy one…but this one, by far, is my favorite. I always look forward to the Eve & Roarke parts. I never skip over parts involving the main plot – but it is the MC interaction that I look forward to. The murder mysteries/suspense is always interesting – but very rarely equals the romance (exceptions that come to mind are Conspiracy in Death, Divided in Death & Creation In Death). In this case, the mystery/suspense eclipsed it. For once, I was actually impatient through the Eve/Roarke sections because I wanted to get back to the main action! Peabody accidentally becomes witness to corruption in Cop Central, and she and Eve are primed and ready to take them down. One of my favorite parts of Treachery in Death was getting to see Eve as a Lieutenant. She always has been, but normally we just see her detective side. This time, for reasons related to the plot, we see her authority as an LT and I absolutely adored every second of it. I also always love seeing Eve interact with authority (Tibble and Whitney). I love the relationship she has with her boss, and we get quite a bit of it in this book. 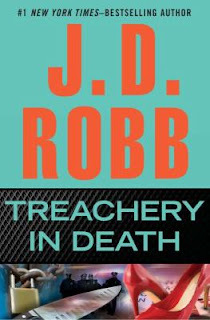 Seriously you guys, if you enjoy a good mystery, you have got to pick Treachery in Death by J.D. Robb up. It isn’t really necessary to read any of the other books first, although of course I recommend the entire series. The first book I read was somewhere in the middle, so I didn’t read them in order either. You won’t have the same depth of feeling for the characters, but you will definitely still enjoy the ride. Simply put, Treachery in Death is best book of an amazing series, don’t miss it! Well I love mystery so I think I would like this. I'm wondering if I should start from the beginning of the series though? !